After you install Azure CLI (on your Windows, Mac or Linux) you have everything you need to manage your Azure account. But in order to do so, first you need to login to your account with CLI. There are two ways to do so. This will prompt you for your username and password. You enter your username, your password and you are good to go. 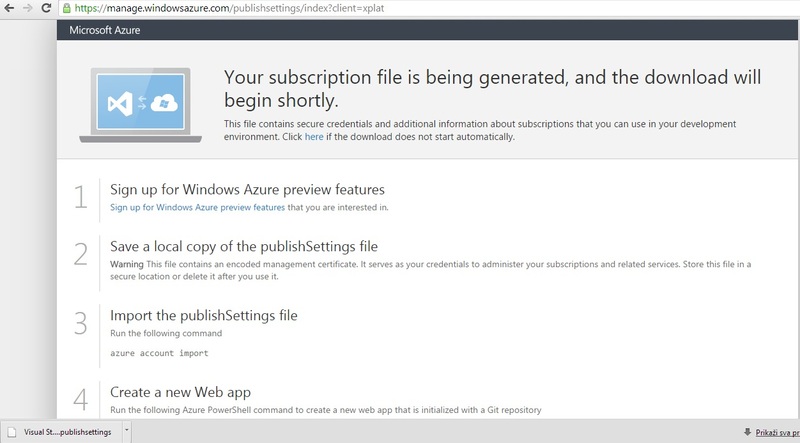 But this is only possible if you have Azure AD in place and use your AD account to login. If you use any other type of account, you will not be able to login this way. If you use this type of authentication, you will need to import your publishsettings and here are steps to do so. After this, you are good to go and you can start managing your account. There are few other things you can do with your account and subscriptions. This command will show available subscription on your account. In my case, I have two MSDN subscriptions and it shows both of them. This will show your active subscription. All commands will be executed on this sub. Any VM, service, website you create will be assigned to this subscription and billed to this subscription. Also note that subscriptions are in fact separated and if you spend all credit on one subscription, services that use this subscription will be stopped for end of month. It will not automatically start using credit form other subscription(s) even you have credit on them. Services will be put in read-only mode till start of next billing period when you can start them again. After this, all resources created will be associated with this subscription. Interesting part with this type of authentication is that once you import yur settings file, you session stay active no matter what you do. You can close CMD window, restart or shut down, you session will stay active. This will end your session and you will need to import your settings again. So much for this time, hope it helped at least someone. It is actually a nice and helpful piece of information. I’m happy that you simply shared this helpful info with us. Please stay us informed like this. Thanks for sharing. Some genuinely marvellous work on behalf of the owner of this website , utterly great content material. I blog quite often and I really appreciate your content. This great article has truly peaked my interest. I am going to take a note of your website and keep checking for new details about once per week. I opted in for your Feed as well.